Hiring an unlicensed contractor can result in a wallop to the wallet for what too often is shoddy work or even damage to your property. This time, however, it was the contractors who paid the price. 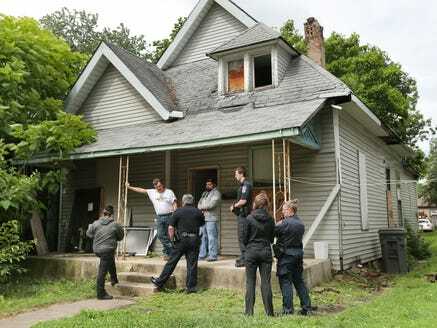 Indianapolis code enforcement and police officers cited unlicensed contractors Saturday as part of an effort aimed at protecting homeowners. Authorities had posted ads on sites such as Craigslist listing jobs for contract work. Those who responded were checked through the department’s licensing database. And those who were not licensed? They were invited to come to a home on the 1200 block of Talbot Street — the “bait” home. James Hercamp of Indianapolis was one of those people. Hercamp said he was set up. When he arrived at the home, code enforcement officials walked him through the house and asked him about repairs that required permits. And then they introduced him to the police. He was given a $250 fine and encouraged not to take any more contract jobs until he obtained a license. Individuals and organizations engaged in contract work in Indianapolis are required to obtain licensing in either general, electrical, heating and cooling, or wrecking from the Department of Code Enforcement. Plumbing contractors are licensed through the state. The requirements for contract work and licensing are available on the city’s website. The most expensive license is $247 — just less than the fine. The website also lists licensed contractors. Hercamp said his insurance company told him he didn’t need a license to do general contract work. Besides, he said a license shouldn’t be required. In addition to the “bait” home, Kyser said inspectors also checked various addresses Saturday where they suspected unlicensed contractors were doing work. Kyser said the city will provide a specific number of those cited Saturday on Monday. Jack Gilpin, of Indianapolis, who also was fined at the “bait” home Saturday, said, he, too, had been informed by his insurance company that he didn’t need a license to do general contract work. Now that he knows, he said he will apply for a license with the city so he can get back to work. He also has this bit of advice for contractors: Ask more than one source about what’s required.